Jane Saks in front of her “Working In America” exhibit at the Harold Washington Library. Jane Saks is a lot of things. Author, writer, poet, activist, educator, and collaborator are just some of her titles. She has dedicated her life to advancing human rights and social justice; first coming to national attention as the founding director of Columbia College Chicago’s Ellen Stone Belic Institute for the Study of Women and Gender in the Arts and Media, which launched prize winning work. She is currently director of Project&, a Chicago-based arts organization that collaborates with artists to create new work with social impact. At the core of any project that Project& will undertake is participation — for example, the organization’s current project “Working in America,” which was inspired by Studs Terkel’s oral history “Working,” combines photography, oral interviews and online stories and allows viewers of it to add their own stories to an online repository. Saks worked with Pulitzer Prize-winning photographer Lynsey Addario to bring Terkel’s project into the 21st century — photographing and talking to common people about their work and how they feel about it and in a few cases, using the same subjects that Terkel did forty years later. 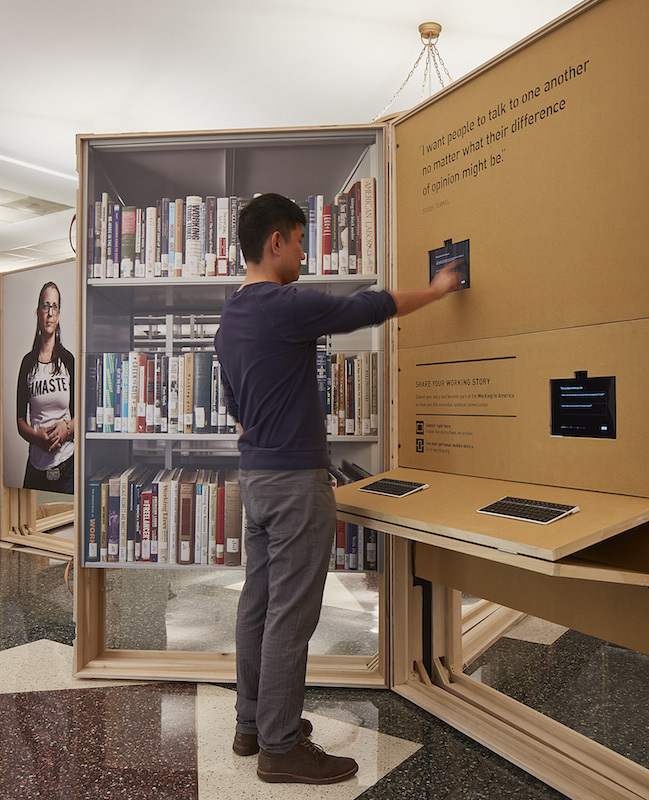 In addition to the exhibit currently on display at the Harold Washington Library, Project& is helping to create a 12-part radio series that will air on National Public Radio that goes along with it. Recently The Chicago Ambassador’s Bob Chiarito spoke with Saks about “Working in America” and her opinions on the power of art. A patron participating with the interactive “Working in America” exhibit. Photo by Tom Harris. CA) You are a lot of things. What do you consider yourself? SAKS) I am a lot of things. I always make the joke that I don’t have a noun in my title because I’ve been so many different things. A friend at a foundation called me a cultural alchemist and I thought that made sense. Sometimes the work like “Working in America” is my idea so I conceived of it and curated the exhibition and also developed the pieces and found collaborators. Other times I’ll partner with an artist who is doing a project and work with them, maybe thinking about new ways to engage it or expand it. I do a lot of different things. Sometimes people don’t know that I’m at the center of creating something. I’m a collaborator and a creator, an author, writer, creative advisor, sometimes I’m the source of an idea… It’s really a lot of different things. CA) It seems like activism often inspires art. Do you think art inspires activism also? SAKS) Oh yeah, I absolutely do. I actually think it is that way more often. I think that art is often ahead of the curve — before society, before advocacy, before government. I think that often art leads society in that it proposes new ways to think about things. I think art is ahead and we can see that in a lot of revolutions and real social changes. Whether it’s in South Africa or the Civil Rights Movement, in Central or South America, you see it all over. I had some friends in the apartheid struggle who told me art brought them in. I also think art is about justice. Abbie Sachs, a great leader in South Africa always talked about art and justice and the thing they have in common, human dignity. CA) Art that makes a social or political statement often seems to come from a minority group or from more of a left-wing side. Do you think there is any valid art coming from the right side? SAKS) I don’t know about valid. I’m not sure that I would use that word. I think that art is inherently political because it creates conversations and challenges us and makes us think in ways that we might not. I think that can happen in any political direction with any group or society. Art is a tool for everyone and part of what makes it so powerful. It’s a great tool for democracy because it is for everyone and we can engage in ways that are equal. It can come from any direction though. There are lots of songs about the Civil War that came from both sides. So I don’t know if I’d say right or left, but throughout history, people in every position have used cultural experiences to express their opinions. CA) Do you think with the recent election that Donald Trump has somehow been a gift to artists? SAKS) I don’t think Trump is a gift to anything. I think he’s forced us to face our systemic weaknesses but I wouldn’t call him a gift. Art is about going towards the tension. I think that anytime that the world offers opportunity for unusual and creative expressions, it’s a rich opportunity for all of us. Pablo Neruda would talk about the blood in his streets, and we would never say the blood is a gift, but he would use his poetry to talk about the kind of struggle that people remembered and responded to in a way they wouldn’t if he used another way of talking about it. So I can’t say that Trump is a gift, but there is always opportunity to engage in difficult dialogues through art and culture and I think that’s what art does in a way that nothing else can. It not only helps us tap into our humanity but sometimes it helps us tap into our lack of humanity. CA) It’s kinda like if you have some personal heartbreak, you can use that as motivation to create something. It’s not that you’re happy for the heartbreak, but at least you derive something out of it. SAKS) [Laughter] There are some situations where there is no silver lining, but it’s good to find fertile ground. I think this has been just been a really destructive time in the U.S. as well as the world. This rise of a fascist mentality and this ‘us and them’ thinking. I think there is only us. I think the sooner we realize that there is only us, the sooner we’ll understand our similarities and differences. It’s not like Trump came up with all these ideas. They have been living in our society for a very long time. He might have given them permission or unearthed them, given them a platform or made it okay, but people were racist before Trump. They were violent, they thought ‘us and them’ and it’s something we embrace as a society and art creates the opportunity to do so because it’s not afraid. Art is not about creating an experience, it is the experience. Art can be and is an authentic experience in itself. CA) I read a lot about you and read that when you were 10-years-old that you were intrigued by the Watergate hearings and wrote a letter to a senator. For you, is there any art that isn’t political or does any non-political art move you at all? SAKS) I don’t think of it in such a traditional way. I think that art is political because it addresses our interdependencies as well as our solitude. So there are poems that I read or write that are really about a type of personal politics, about who I am in the world and where my heart is. When I think about art being political sometimes it’s about a conversation with yourself. It’s not always about voting or a social issue. It might be an issue with yourself, who are we and where are we in our interpersonal relationships or where we are in the world. That’s what I mean when I say all art is political. It addresses difficult conversations and sometimes on a very discreet, personal level. It’s not always on a big public level. CA) Let’s talk about Project& and “Working In America,” which was inspired by Studs Terkel’s oral history “Working.” He was a friend of your father’s, correct? SAKS) Yes, he was, so I spent time really understanding the city and its humanity both through my dad and Studs Terkel. I really understood the idea of people being experts on their own lives and really understood what it meant to really listen to people’s stories. We’ve been public for 3 years, but about 4 years ago, a small group came together and created Project@, where we collaborate with artists to create new models of participation with social impact. We really want to create visceral and immersive experiences that extend empathy and participation. It really helps us to soften the borders between us and also think about ourselves and relocate ourselves in ways that are often challenging, inspiring, sometimes really risky. We always begin with artistic excellence and collaborate with artists who are thinking about some of the biggest, pressing issues of our time. We are creating new models of cultural participation. (From “Working in America”). Jeanette TK, waits tables at TK in New York City. Photo by Lynsey Addario. CA) Project& is an ongoing venture, correct? SAKS) Yes. Project& is a new arts organization. We really are developing models that we are hoping will be used by other people — governments, activists, organizations and the UN. CA) And the “Working In America” project? SAKS) That’s ongoing as well. We are raising money to tour it around the country. It’s at the Harold Washington Library now but we will also be bringing it to a couple neighborhood branch libraries as well. We’ve also produced a 12-part series to go along with it on National Public Radio and will be doing an hour-long show for them to air next Labor Day. On December 8, we will be having a big event at the Harold Washington Library that will be recorded and broadcast later on WBEZ. CA) Are most of the ideas for the projects Project& does generated by you? SAKS) “Working in America” was my idea. I really wanted to work on something that had to do with economic inequality. It’s one of the big conflicts of our time. So, I came up with the idea and then went to my bookshelf and found Terkel’s book “Working” and realized it had been exactly 40 years and thought, ‘This is perfect, I can revisit working.’ So that idea came from me but other times, the ideas are more collaborations. From “Working in America”). 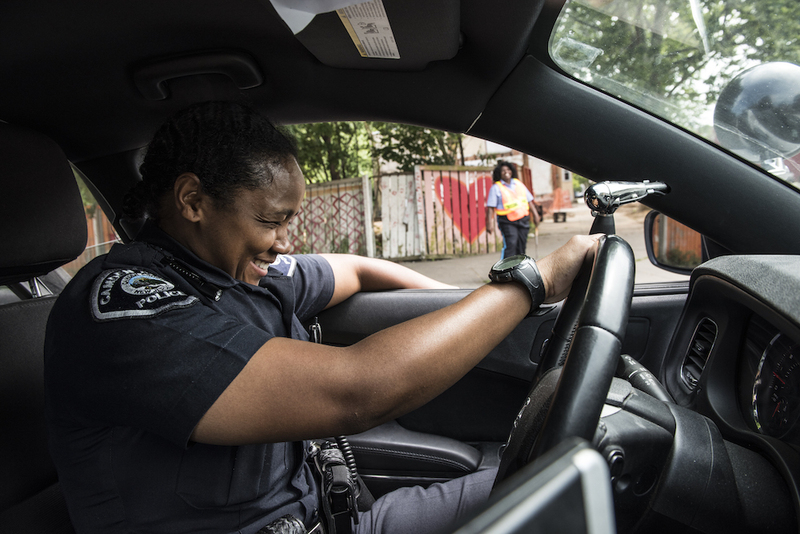 CaBria Davis, Camden, NJ, works the beat as a police officer in Camden, NJ. Photo by Lynsey Addario. CA) I know there are a ton of issues that you’re involved with and concerned about, but are there any that you would say are tops on your list to tackle next? SAKS) I think issues of violence, race, gender are all issues that I really want to address. Inequality in our society and systemic changes are others. All the issues I’m looking at have to do with the democratic process. 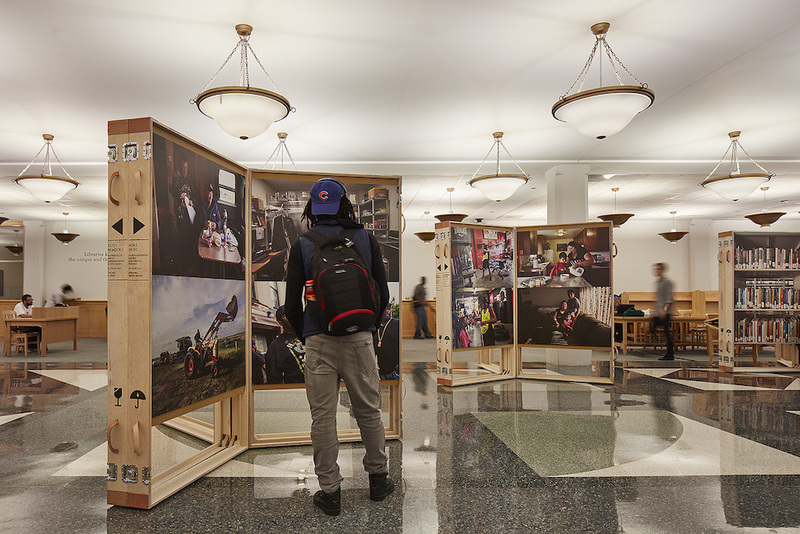 “Working in America” is on display at the Harold Washington Library until the end of January. For more information, click here.